I am making rustic Farmhouse Independence Day decorations for our front porch this year. I have made a Farmhouse garland to go with these decorative Mason jars. Learn how to make your own garland with this tutorial. 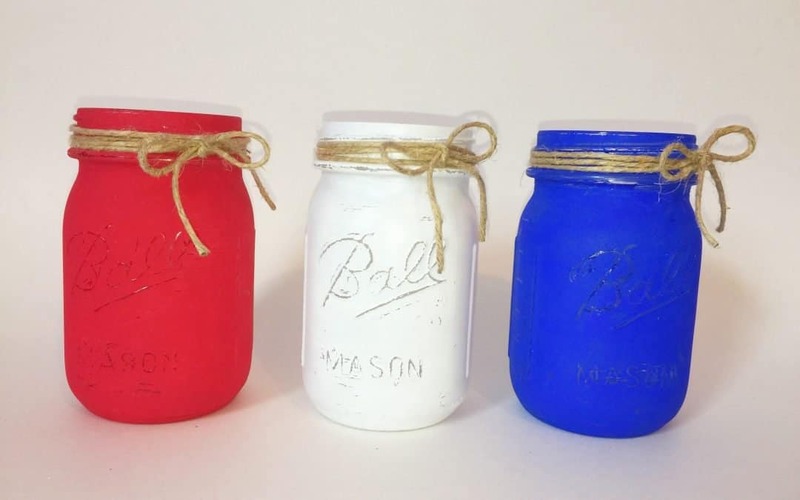 I am teaching you how to paint Mason jars for Independence day decor in this tutorial. To begin, wash the jars with dish soap and warm water. After the jars have dried completely, wipe them down with alcohol using a cotton cloth. The cloth helps prevent streaks. Choose your paint carefully. Not all acrylic paint will stick to glass. 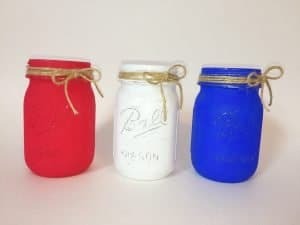 I painted my red and blue jars with regular Apple Barrel acrylic paint from Walmart. It worked beautifully. I was able to layer the colors easily. The white Apple Barrel acrylic paint didn’t want to layer at all. The first layer was easy to paint on. The second layer wouldn’t go on. It stole the first layer of paint. I allowed it to dry completely before I painted on the second layer. I picked up a 2 oz bottle of Apple Barrel Multi-Surface Satin Acrylic Paint at Walmart. Spoiler Alert! It worked out beautifully! Protect your work surface before you begin to paint your Mason jars. I used foam plates, one as my paint pallet and one to sit the Mason jars on while they dry. Put your hand in the jar to paint the outside with the foam wedge. I use these for most of my projects. They won’t leave a lot of bubbles on the surface. They are great for stenciling wood signs too, just a little tip there. Dab your wedge into the paint. Dip the wedge into the paint and pounce up and down on the jar to spread the paint until the whole jar is covered. Don’t worry about filling in every teeny spot if you won’t your jars to look rustic. Let the paint dry completely. I added a second layer to all of my jars. Note: Skip this step if you don’t want your jars to look rustic. Use the sandpaper to randomly rough up all of the jars. I like to sand over the words on the jar and keep the color in tact. be sure to lightly wipe off any sandpaper and paint crumbs from the jar. Wrap the jute around the top of the jar and tie it in a knot, then tie it in a bow. 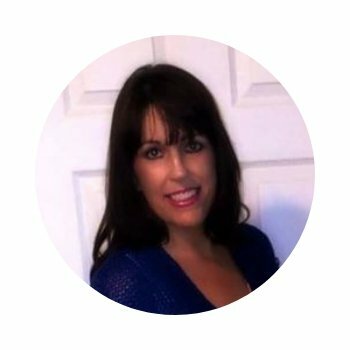 You can add flowers or decorative buttons to the top. It’s entirely up to you. 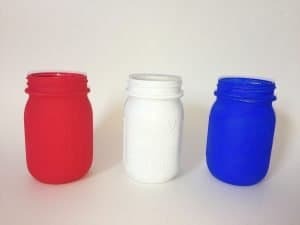 I will be using my Mason jars as vases in my Independence Day decor for our front porch. See how easy that was! You can make these Mason jars in different colors. Paint them for holidays or use them in Farmhouse decor. I am designing a Farmhouse gallery wall in my dining room. I will be making one of these Mason jars to add to it.